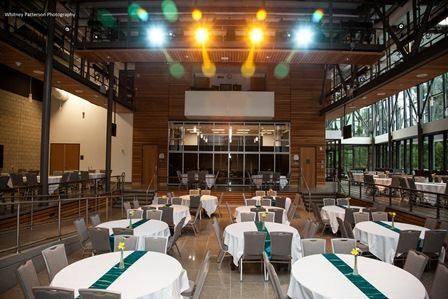 Located just 30 miles outside of Seattle, Green River Conference Center’s serene park-like setting provides a beautiful location for any event. Our professional staff has been hosting weddings, receptions, seminars, conferences and special events since 1971. We offer a wide variety of meeting room and banquet spaces for customized events of 50 to 600 people. Affordable packages include room rental, audio visual rental and tech support, and on-site catering services. Rental rates are per day and include up to an eight hour event rental period and two hour setup and teardown time. Room capacities will vary by setup; however, at no time may attendee count exceed maximum occupancy levels. All room rentals include campus-wide wi-fi and each room’s fixed furniture. Larger classrooms with capacity of up to 100 $150.00 Mel Lindbloom Student Union building (SU bldg.) Grand Hall Rentals start at $1100.00 perfect for Weddings, Receptions, Auctions, Conferences, Performances. with the expansion of the River rm, seating Banquet for up to 410 and theater for over 600 River room Rentals start at $300.00 perfect for business meetings, small banquets, retreats etc Pine, Noble Willow rental for 3 room combo $175.0 individual $75.00 ea three room expandable space that can be used as individual rooms or one large space, great for meetings, classes and retreats Emerald City Room rental $200.00 Great space for board meetings, trainings, small banquets. Salish Hall Lobby or Rooftop Deck (80 capacity) $300 Unique location to host a social or business reception. Cascade Room (100-500 capacity) $700 Large banquet hall with professional stage - perfect for a conference or performance. Campus Classrooms Up to 45 person seating $75 50-125 person seating $150 Technology Center Computer Lab (30 capacity) $300 Individual work stations for each participant. Additional adjoining labs available for larger groups. Physical Education Gym (2100 capacity) $1,000 - additional fees may apply Large auditorium to host fundraisers, sporting events, festivals, as well as multi-event tournaments. 8-Hour Wedding Reception $750 (Seasonal) Choice of indoor or outdoor reception option: • Open, but intimate entry hall with high ceiling • Rooftop deck with view of campus and courtyard Tables, chairs and linens for seating up to 80 guests Gift, cake and guest-book tables with linens and draping Limited decoration package to include tulle swags and centerpiece glassware Experienced, on-site day of event coordinator Two hours for setup; five hour event time; one hour for breakdown 12-Hour Ultimate Wedding Package $1200 (Seasonal) Includes above features, plus: Outdoor Wedding Ceremony Option • Choice of rooftop deck or landscaped courtyard • Seating for up to 80 guests included • Sound system with on-site technical assistance • Dressing rooms for the wedding party • Inside location will be secured in case of inclement weather One hour wedding rehearsal Two hours for setup; eight hour event time to include preparation and photography; one hour for breakdown. Add-ons: Additional Event Time $150 per hour, Additional Set-up/Breakdown Time $50 per hour Chair Covers and Coordinating Sashes $3.50 per chair (installed) Catering may be provided by Spectra, our on-site professional catering, or another prequalified caterer. Black box Theater with adjoining lobby area with seating for 217 guests. Professional sound and lighting assistance available. Atmosphere/Decor: Modern architecture, open and expansive floor plan. Large banquet room that can be used as a single room or can open up and be an addition to the Grand Hall. This room is great for banquets, holiday parties, business retreats, town hall's small wedding receptions, birthday parties. Atmosphere/Decor: Large open space with windows, white boards, and monitors as well as audio visual built in. Our newest building on campus provides a modern and "green" backdrop to your next event. It provides a mixture of classrooms, a tiered lecture hall, rooftop balcony and event spaces. 30 laptop stations per computer lab. Open them all for a room that can hold 90 participants. Terrific room for computer training, breakout session, or business meeting. Large auditorium to host fundraisers, sporting events, festivals or large dinners. Transform this space to hold multi-event tournaments. Maximum capacity over 1500 people.